In the last section the rotation of Earth’s outer crust was discussed and that what we experience as the North and/or South magnetic pole is located in this massive bulk comprising 45% of the Earth. It was suggested that in a large comet impact the outer crust will rotate on the inner core but will move only so far before it ‘locks’ into another stable magnetic position. In the first image the round magnet sits at the edge of a flat magnet. Notice the tilted angle. The attraction here is so strong that it can pull the large flat magnet. When it is set at the center or pole of the flat magnet, it sits parallel to it as one expects. There it slides easily over its surface until it grabs at the edge as shown. This is its ‘next most stable position’ and definitely where the convergent and divergent magnetism forms the strongest bond. 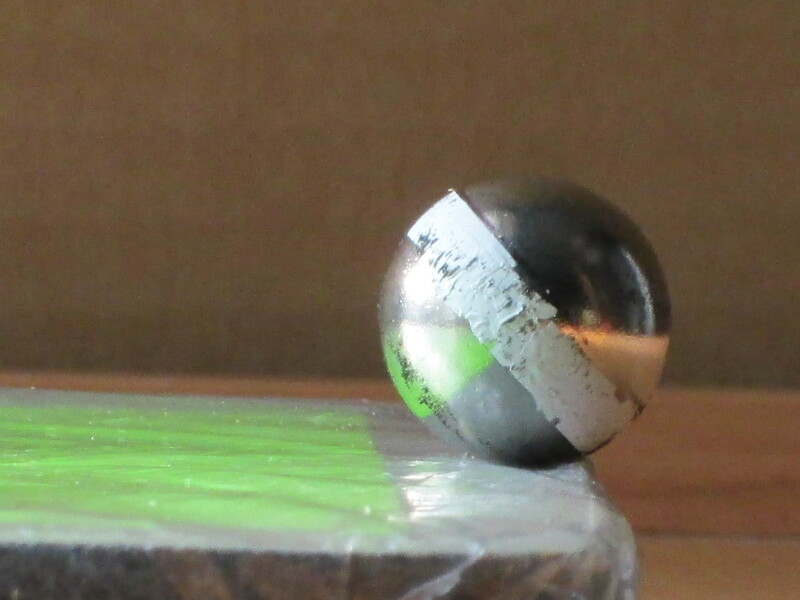 A round magnet sits at an angle on the edge of a flat magnet. In the next image of Earth notice that between the outer crust and outer semi-solid core there exists a layer that is considered to be highly viscous. It is proposed that this layer is the interface where the slippage of the outer crust occurs. Notice that it is directly below North 56.5 degrees of latitude. The Earth’s North-South line was severed in the impact as the outer core rotated. The opposite pole developed against the slip layer and it then ‘locked’ with the divergent magnetism of the inner core at North 56.5 degrees. It turned 33.5 degrees. The line of movement was along longitude West 79.2 degrees. The magnetic locking of the outer crust stopped it from rotating further and fortuitously allowed life to continue on Earth by assuring shifts in climatic zones overlapped to some extent. The Earth’s magnetic poles shift with the outer crust and are realigned overtime by the Earth’s stable inner iron core. The Magnetic North has moved significantly over the last few decades. It is now very nearly aligned with True North. 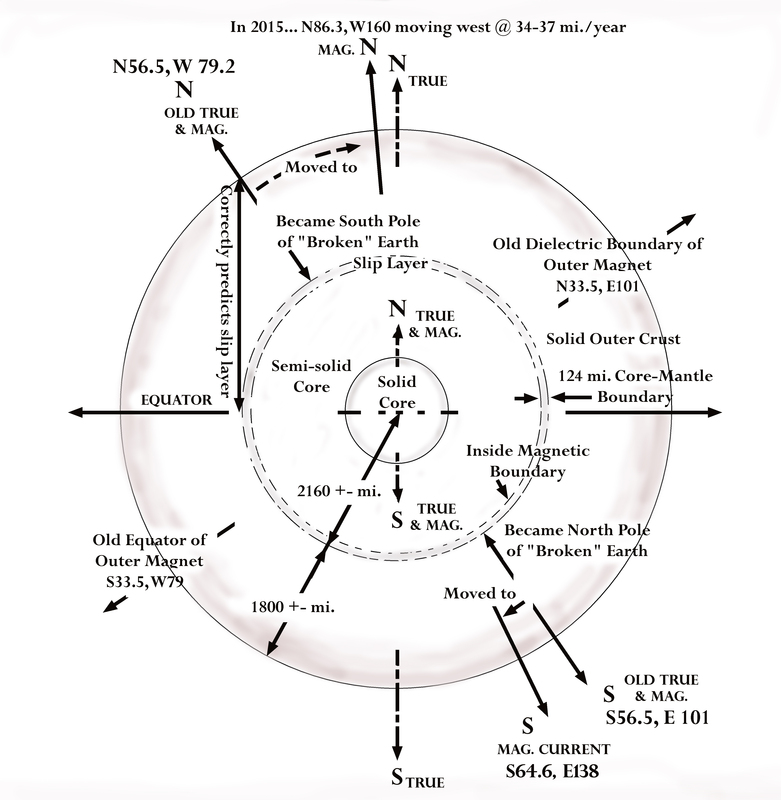 The Magnetic South Pole is moving as well but at a slower pace. The Earth is a magnificent structure that is able to absorb an impact from a large comet and minimize the damage. Its outer layers are able to rotate as if on a free axle which absorbs the energy of the impact. It then stops the rotation of its layers as they lock again magnetically. Back to first post on magnetism. In the previous section the idea that Earth’s magnetic field is solely the result of the moving liquid core was reviewed. There is another way to view the process. It is proposed that the magnetic properties of Earth are primarily held within the solid core and solid outer shell. The resultant magnetism is the sum of both the properties of the solid materials themselves and the magnetism induced over extensive periods of time into the composite structure by a consistent flow of convective materials in the liquid core. The orientation is held in the solid materials and need not be constantly generated by the randomly moving liquid. Continuing along this line, the Earth is obviously not a completely coherent object. A single magnet has absolute coherence regardless of size and strength. An arrangement of an infinite number of magnets in any material that does not exhibit magnetic properties as a whole occurs because the magnets are not a coherent system. As coherency develops in the system magnetic properties are exhibited. This is how magnetism is induced in a needle simply by stroking it. Coherency can be induced in more than one way to ‘create’ or ‘induce’ magnetism. The Earth must have enough coherence, although a conglomerate, since it exhibits a dominant dipole system which we call its magnetic poles. Applying the idea of a quadrupolar field model (see previous section) requires that Earth (a predominately solid 3-D sphere) become so disorganized that it loses a great deal of its coherence. Since the bulk of Earth on the exterior is dense rock, and additionally, it has a large solid core, making it lose its coherence so that it loses its dominant magnetic dipole field becomes literally a shattering of the planet which obviously has not happened in a very long time. In contrast, if we are to believe the Pétrélis article, referenced in the previous section, then the flow within the liquid core is strong enough to create a magnetic dipole at anytime that can overcome the sum magnetic fields laid down over time in the remaining 65% of the solid planet. Above is a video by magnetism guru Ken Wheeler showing how magnets affect a mixture of iron filings in fluid. Many other videos can be found on youtube. By maintaining the magnetic orientation in the solid structures the fluctuations caused by the moving liquid core are dampened. The moving liquid core is agitated during large comet impacts which must occur more frequently then modern scientists will allow. The liquid core must also move in response to the attraction/repelling of particles between the two magnetized structures it resides between in addition to convection. (See Ferro-Fluid video above.) The system must run down (become incoherent and stationary) and thus lose its magnetic nature over time without periodic inputs of energy as would be supplied by large comet impacts. Indeed, the interior of the planet itself would cool perhaps solidifying this liquid core without such inputs of energy. As discussed in “A Planet Most Miraculous” the Earth is well suited to absorbing large impacts. By assuming that the dipole of magnetism we experience as the North and South poles is primarily held in the exterior layer some 1800 miles thick or 45% of the diameter of the planet which can move relatively freely around on the inner liquid core explains several observed phenomena. The core is considered to be solid iron which is one of the most ‘magnetizable materials’ in existence. It comprises 20% of the diameter of the planet. In addition, it is at the center of a large gravitational body and what is gravity but magnetism under a different name. By assuming that this inner core of the planet is another magnetic structure with its own orientation which tends to remain fixed in the True North-True South position explains other observed phenomena. These two structures account for 65% of the diameter and provide ample storage for the Earth’s magnetism. As explained in “A Planet Most Miraculous: The Mechanics of Earth’s Rotating Crust” the entire outer structure of the planet can be acted upon which will cause the exterior magnetic poles to shift to a different position with respect to the ecliptic plane but remain in the same position with respect to its physical location on Earth. The magnetic dipole field we observe, measure and live by is largely a function of this programmed magnetically coherent conglomerate outer bulk. This is a very important point so it will be explained further. Let us say that very recently (5000 to 13000 years ago) True North and Magnetic North coincided at the True North Pole. The physical location was in the midst of Hudson Bay at the lowest large arc. But! – Hudson Bay existed not as it is but as a mountainous ice field at the True North Pole. It was many miles high. (The highest mountain in Antarctica is three miles.) A large comet strikes the north pole into this mountainous icy region. It bores a deep hole which gives it a leverage point in which to catch. Combining this with its velocity and mass it is able to transfer its momentum to the structure of Earth. It shifts the outer mantle and crust entirely just like a wheel moves on an inner bearing and it stops at latitude 56.5 degrees north and goes no further. (Why it stops here is discussed in later sections.) The heat of the comet and its velocity allow it to break through the ice. Its fragments ricochet to form the Great Lakes. Large volumes of ice also ricochet to form other structures such as the Carolina Bays. The ice mountains have been transformed into the three arcs of Hudson Bay. This is an area some 400 miles wide and a 1000 miles long once covered by three miles or more of ice or 1.2 million cubic miles of ice. It was instantly melted and so the legend of the Deluge begins. Afterwards magnetic north lies at 56.5 degrees north. It has shifted 33.5 degrees. In this location it remained for a few thousand years until the magnetic pole gradually shifted northwards. It has moved rapidly over the last 400 years or so to take up its present position. Now it will slowly circle the True North Pole in a clockwise direction. This will be discussed again later in more detail but for the time being understand the following. If the dominant magnetic field of Earth was not essentially within the outer 45% of the planet, it would not have shifted during the impact. There would never have been a two pole (True-Magnetic) system. The stable configuration has now been achieved in the North again and the Southern Poles are slowly moving into realignment. This will hopefully be a good long superchron until the planet is hit again and the process starts all over. The fact that the magnetic poles are realigning to true north-south suggests that the solid inner core’s magnetic field is the more stable part of this system. This is logical from the standpoint that the very dense core, as an inner spherical magnet made of iron, throws its field entirely through the outer layers especially the liquid outer core. The reverse cannot be said of a hollow sphere magnet (the outer crust which is a conglomerate), nor can it be said of the liquid core. This throwing outwards through the liquid core gives scientists the impression that the liquid core has a substantially stronger field (50 times more powerful) than the solid core or outer crust. But remember, the field of a magnet is thrown outwards, hence the liquid core is substantially under the influence of the solid core. Recall that a magnet draws material to it and a strong magnet is able to highly compact its ‘atoms’ into a lattice structure. (Chemists successfully use the atomic model to understand the process although it is has its limits.) Two things occur as a magnet becomes more powerful. There is more sharing of electrons and the crystal structure becomes more dense. It is the magnetic properties of the individual atoms (magnetic moment of electron spin) that confers magnetism on the sum of the material. When working in unison the magnetic properties of the individual atoms grows exponentially as resonance develops. (1) With this understanding we realize then that the solid core is 50 times more magnetic than the liquid core. Not the reverse as commonly understood. Other observed phenomena will be discussed going forward. More to come…. in the next section. Back to previous section. Back to Index and beginning. (1) Nebergall, William, Schmidt, Frederic, Holtzclaw, Henry, “General Chemistry”, Lexington, Ma. : D.C. Heath and Co.,1976, pg. 771 -788. What Strange Secret Lies Hidden Here? The Mighty Religion of….? Baal? Ancient Words of Genesis I — is here! Did the Crust of the Planet Turn? Is Earth Losing its Magnetism? Where Oh Where are the Poles Now! Ancient Riddles to Test Our Wits: Ancient or Modern Copies?